One hundred and twenty million years ago, they were the predator kings and queens of western North America. While their reign only lasted four million years, packs of Utahraptor terrorized the local herbivores both large and small. Based on the fossil record, Raptor Red tells the story of the title character as she and her family struggle to survive in the Jurassic. 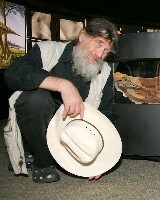 Paleontologist Robert T. Bakker, penning his first novel, initially became famous as author of The Dinosaur Heresies (1986), which proposed that dinosaurs were warm-blooded, fast, intelligent and more closely related to birds than to other reptiles. These theories have had a major impact on the current understanding of these charismatic animals, both in scientific circles and popular culture. other resident dinosaurs, pterodactyls, crocodiles and turtles are equally fascinating, providing a convincing account of their perspective on events. We follow Raptor Red as she strives to find a mate, supports her sister and her offspring, competes with other predators and stalks various massive beasts. Bakker goes out of his way to emphasize the similarities between Utahraptor and modern day predatory birds like hawks and eagles. He even describes what it might have been like to be the first intelligent creature to encounter the first flowering plants. While it’s clear that Bakker is more scientist than novelist, this 240 page adventure is thoroughly enjoyable. The author’s enthusiasm is quite contagious and while a skeptic might not have much difficulty poking holes in some of his ideas, I appreciate his willingness to go out on limb and put some passion and imagination into an otherwise dry topic. Raptor Red is an unusual kind of paleontological science fiction work – solidly based on science fact – entertaining the reader with a trip deep into the past. Recommended for those interested in dinosaurs, especially any young budding fossil fanatics. Anyone who enjoyed Jurassic Park – book or movie – will find this work equally compelling. Kudos to Bakker for thinking outside the rocks.